It's time for Friday5 again! 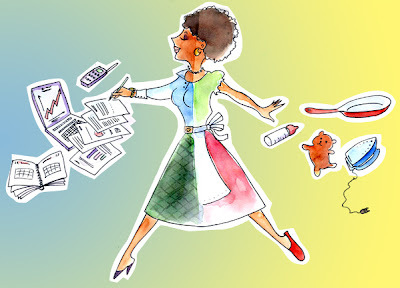 And my new illustration (which is already on my website) fits perfectly to the theme of the week: Everyday Tasks. 1) What everyday task is more difficult for you than it should be? Brushing my teeth. Dunno, probably I have an outstandingly sensitive gag reflex, but I HATE to do it. 2) What everyday task do you usually put off for as long as possible? 3) What everyday task do you perform especially well? Cooking. I just LUV cooking and I think I can say that I do it very well. 4) What everyday task has most recently been added to your every day? Checking if the house plants need watering. I know, I don't do it very well, but I am trying to remember. 5) What everyday task makes the least sense to you? Making a bed. If you have a bedroom where nobody go the whole day - why do you still need to make a bed? As one comedian said: "They told me that the bedspread would protect my bed. But nobody's attacking it!"